« More Pretty Weather Coming! 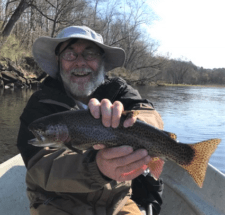 Lots Of Fishing Going On!…and Catching! This great weather we have been having is going to come to an end, at least for a few days. We have a severe thunderstorm watch in effect from 11:10 a.m. today through 7:00 p.m. This is going to drop our temperatures into the mid 50s tomorrow. Saturday will definitely be a jolt as the high might be upper 30s with rain and snow showers possible. The good news is that Sunday will be in the low 50s with sunshine. Monday through Wednesday look like 50s with various moisture possibilities. But by Thursday, we’re back into the upper 60s going into the 70s Friday and through next weekend. Generation continues to be a mystery. I love a good mystery. Although there has been a projection for water every day, from mid-day Friday until late Monday night, we had no generation. Great weekend. Tuesday they turned on a couple units for a little while in the morning, then off. Late afternoon, they turned on a couple units again for a few hours, then off. Yesterday we had three units going early and they dropped a little all morning but not enough to easily wade. They finally turned it off at 1:00 p.m. and fired them back up at 4:00 p.m. So far today, we seeing two units with a level of 705.0′ give or take a few inches either way. Stan out last Friday with George from Wisconsin. They had a good day on the black copperhead midge early, then the hot hare’s ear nymph, and finished up with the white grub worm. feel the take. Jan started out midging, but we got her into stripping and she is going to master this method too. Tuesday. These guys had a great day stripping the filoplume early and when the fish shut down on this, we finished up the day with the Tiger Tail. Wednesday Jim and Gina out all day. Water generation funkie this day, but they had another great day on the Ruby 2, Tiger Tail and a peach egg pattern. Beautiful day, especially in the a.m. Started getting a little wind later in the day. Carolyn had Len and Don on the water again. This time it was just for half a day as they wanted to get back home before dark. Another wonderful day! Since water was running pretty good, most of our good stripping places were gone. So, Len and I worked on Don’s midging technique. Mastered! Well he is making great progress with this method. Tried several patterns and the Ruby 2 was the fly of the day. We did find a spot below Lookout Island where Len pulled in some fish on the Tiger Tail. Needless to say, Len came back to the shop and purchased materials to make the filoplume and Tiger Tail! 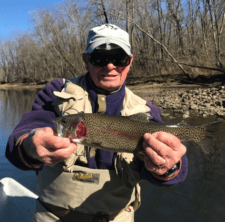 Stan had one of his favorite ladies, George, on the river Wednesday the afternoon. She had a wonderful time catching on the Ruby 2 midge. She has a place at Bennett Springs but enjoys fishing Taney for a nice change. 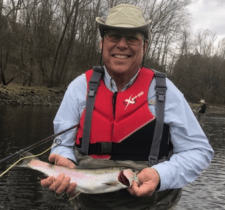 Spey/switch rod clinic – March 25, 2017 – Call to sign up. 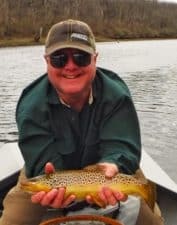 This entry was posted on Thursday, March 9th, 2017 at 1:31 pm	and is filed under Fishing Reports. You can follow any responses to this entry through the RSS 2.0 feed. You can leave a response, or trackback from your own site.